Think of tree trimming & tree pruning as a haircut for your trees. It not only makes them look good but is also good for long-term health. Young trees can benefit from pruning for structure, a practice we promote that allows healthy growth of the tree, without the need for drastic pruning, as it grows larger. Main branch structure is initiated and poorly attached limbs that will cross paths in the future are removed, or cut back to a proper bud or branch. 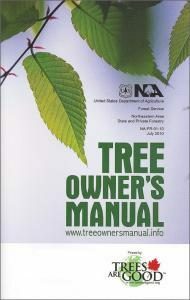 While trimming younger trees is the ideal place to start, mature trees should also be periodically pruned to remove diseased, dead or dying limbs as they can be dangerous to person and property. Canopies of mature trees can also block sunlight which will inhibit the growth of other landscaping as well as your lawn. The thinning of tree canopies can give your yard much more light and make growing plants and grass much easier. Contact Us today to get a quote on tree trimming & pruning. 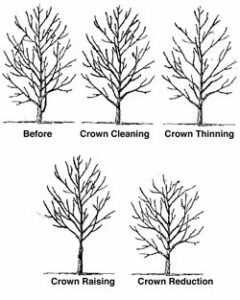 Crown Cleaning: This involves selective pruning of dead, diseased or broken limbs. Canopy Raising: Elevating canopy for clearance from ground. Canopy Reduction: Selective pruning to reduce height and spread. 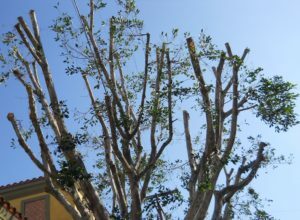 Tree Restoration: The pruning of limbs to restore structure after storm damage or tree topping. Structural Tree Pruning: Pruning to improve branch architecture. Thinning: This type reduces the density of the canopy and the branches within. Vista Pruning: This type of tree maintenance involves selectively pruning to enhance view. Mature trees have canopies that can become too dense. It is beneficial to thin the canopy to allow better air flow through. We Do Not Top Trees (and neither should you)! Topping is perhaps the most harmful tree pruning practice known. Yet, despite more than 25 years of literature and seminars explaining its harmful effects, topping remains a common practice. Sometimes a tree must be reduced in height or spread, such as for providing utility line clearance, so we offer alternative methods. Recommended techniques include removing small branches back to their point of origin. If a larger limb must be shortened, it should be pruned back to a lateral branch that is large enough (at least one-third the diameter of the limb being removed) to assume the terminal role. This method of branch reduction helps to preserve the natural form of the tree. However, if large cuts are involved, the tree may not be able to close over and compartmentalize the wounds. Sometimes the best solution is to remove the tree and replace it with a species that is more appropriate for the site. Deadwood can be dangerous and prevents the tree from healing, therefore possibly allowing disease to enter the tree’s system. 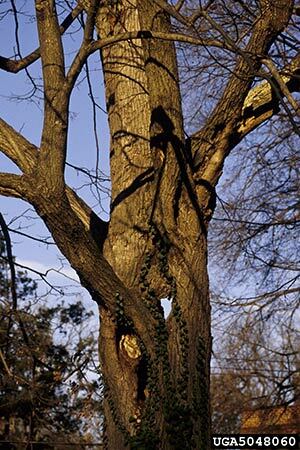 If you see a tree with a hole in it it may be due to a dead limb that was not pruned off. Trees with poor architecture look interesting to the eye but there are several problems that arise from this type of growth habit such as crossing limbs, weak branch attachment and hidden points of decay. We recommend pruning your trees when they are young to create the best chance for success as they age. FCTS offers fine technique pruning such as boxwood clouding, espalier, and pollarding. Boxwood clouding is technique that gives the boxwood shrubs a light and natural cloud-like appearance. Espalier pruning is a technique that is commonly used to train fruit trees on flat surfaces, to assume a desired shape, and usually require steady pruning throughout the growth season. Sometimes a guide wire is used to assist with the growth training. Pollarding is the process of removing growth on the outer most stems of a woody shrub or tree, annually or bi-annually, for the purpose of maintaining a framework of exposed branches. Sometimes very small stems are left to provide budding and flowering of the tree. Topping is not an example of pollarding.